Acclaimed purveyors of magical (classic) World and Soulful grooves, Diephuis & Jephte Guillaume, release their colourful summer Afro jam, 'Baba M'fa Njika' - featuring the electrifying voice of Cameroon’s songbird, Barbara Gwanmesia. As you’d come to expect from this duo, 'Baba M'fa Njika’ is a musical feast of earthy Afro beats, hypnotic synths, infectious sax and rhythmic vocal chants, which, pirouetting around Barbara’s magnetic croon, throbs with the love, hope and gratitude that the lyrics exude. There could be no better expression of positive power than that unleashed on this gem release from the prestigious Shelter Records. 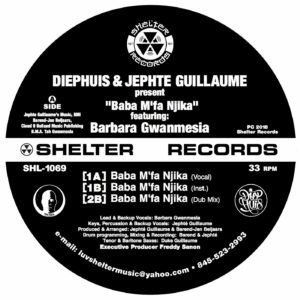 Diephuis and Jephte Guillaume have both individually brought authentic global sounds to dance floors, the world over - each owning and dominating his turf in extraordinary ways. In 2013, the acclaimed producers joined forces for the first time to produce ‘A Journey To Rotterdam’ that was later released that same year on Joe Claussell's Sacred Rhythm label. The Netherlands born Diephuis has produced and remixed many key players on the scene - from Dj Angelo to Ursula Rucker, along with Eastar, Jocelyn Brown, Peven Everett, Stephanie Cooke, Kenny Bobien and Marc Evans - just to name a few. Some of his productions are remixed by the likes of the talented Monoo. His production “Diephuis - Crossing Borders” was the first remix that the Kings of House team collaborated on together. Many important DJ’s in the scene like Black Coffee, Louie Vega, Tony Humphries, Spen, Dixon, Hyenah, Marley Marl, Cajmere and others have played his tracks. His work has appeared on labels such as King St, Nulu Records, Quantize, UnQuantize and many more. New York resident and Haiti native Jephte Guillaume’s musical resume includes works with an impressive array of stars, including Wyclef Jean, Groove Theory/Amel Larrieux, Destiny’s Child, Jermaine Jackson, Busta Rhymes’ band, and literally, a plethora of others. His own productions, which carry rich Latin and Afro flavours, have earned him much respect on the global underground scene. They include none other than the timeless 'Onè Respè’, 'The Prayer', and ‘Kanpé’. His album 'Voyage Of Dreams”, which appeared on labels such as Spiritual Life, King St, Ibadan, Nite Grooves, and Tet Kale - among others, elevated this Haitian born virtuose to the heights of the world's musical greats. Now, along with Diephuis and Barbara Gwanmesia, the great Jephte Guillaume gives you, ‘Baba M'fa Njika’.